Rick Perry is doing his best to make us miss him. After almost six months away from the state to campaign for president, Rick Perry has barely returned to his Capitol office since arriving back in Austin, state records show. In the first 16 days since he dropped from the race, covering Jan. 19 through Feb. 3, Perry went to his office only three times and stayed no more than three hours each time, according to his state calendar obtained by The Dallas Morning News under the state’s public information law. Eleven of those days, no state meetings, phone calls or events were scheduled. Of the remaining five days, he is shown engaged in state business for a total of 10 hours. One day involved taping a message for the El Pasoan of the Year and another was touring a racetrack under construction. Aides say that the governor works a robust schedule from wherever he is and that he conducts state business that doesn’t appear on his official calendar. But the documents indicate that an experienced staff and appointees who know Perry’s wishes continue to conduct the state’s business without requiring much of his time — even as the state faces challenges in key areas such as education, health care and the economy. “It doesn’t matter what time period you look at, this governor always has something better to do than run the state,” said Harold Cook, a consultant who works closely with Democratic state senators. You know, I’m not sure I see what the problem is here. 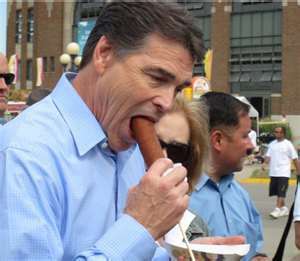 I mean, I think it’s a fine thing that Perry has other things to do than be Governor. Frankly, nothing would please me more than for him to stay the hell out of Austin from now till Election day of 2014. No good ever results from him being here, after all. So keep on traveling, Rick. Keep hobnobbing with the rich and supercilious. Don’t worry your pretty little head about any of that icky policy stuff. You don’t need to know about it. Everyone in Texas will thank you for it. Well, Campos and Juanita will, anyway. This may not last for long, however, because Perry is talking about running again. You know what? I hope he does run again. Frankly, he’d be more beatable than anyone else. Plus, Perry ’14 would stick to Greg Abbott, who would have the choice of staying put yet again, or spending his millions in a bloody primary against Perry. Having Perry at Governor for so long has been terrible for Texas, but it hasn’t been very good for all of the Republicans lined up behind him waiting for the opportunity to move up, either. If he really does have the ego for another campaign, I think there’s a pretty good chance it doesn’t end well for his team.